At the foot of Mount Parnassos, within the angle formed by the twin rocks of the Phaedriades, lies the Pan-Hellenic sanctuary of Delphi, which had the most famous oracle of ancient Greece. Delphi was regarded as the center of the world. According to mythology, it is here that the two eagles sent out by Zeus from the ends of the universe to find the navel of the world met. The sanctuary of Delphi, set within a most spectacular landscape, was for many centuries the cultural and religious center and symbol of unity for the Hellenic world. 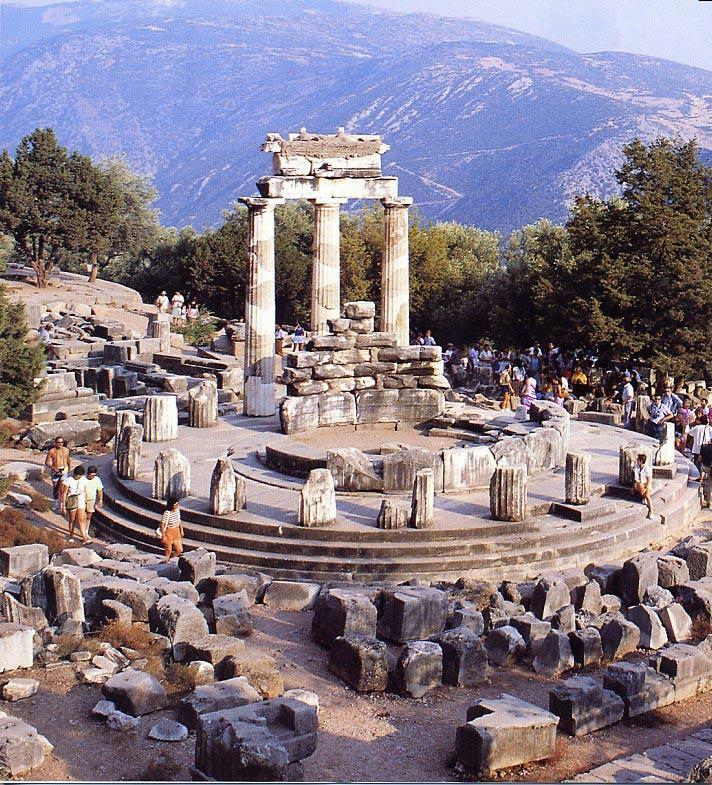 The history of Delphi begins in prehistory and in the myths of the ancient Greeks. In the beginning the site was sacred to Mother Earth and was guarded by the terrible serpent Python, who was later killed by Apollo. Apollo's sanctuary was built here by Cretans who arrived at Kirrha, the port of Delphi, accompanied by the god in the form of a dolphin. This myth survived in plays presented during the various Delphic festivals, such as the Septerion, the Delphinia, the Thargelia, and the Theophania and, of course. The famous Pythia, which celebrated the death of Python and comprised musical and athletic competitions. The sanctuary was the center of the Amphictyonic League, an association of twelve tribes of Thessaly and the Sterea (south-central Greece), with religious and later political significance. The Amphictyonic League controlled the operation and finances of the sanctuary, as it designated its priests and other officials chosen from among the inhabitants of Delphi. In the sixth century BC, under the League's protection and administration, the sanctuary was made autonomous (First Sacred War), it increased its territory and political and religious influence throughout Greece, and reorganised the Pythian Games, the second most important games in Greece after the Olympics, which were held every four years. Between the sixth and fourth centuries BC, the Delphic oracle, which was regarded as the most trustworthy, was at its peak. It was delivered by the Pythia, the priestess, and interpreted by the priests of Apollo.. In the third century BC, the sanctuary was conquered by the Aetolians, who were driven out by the Romans in 191 BC. In Roman times, the sanctuary was favored by some emperors and plundered by others, including Sulla in 86 BC. The rise of the Rationalist movement in philosophy in the third century BC, damaged the oracle's authority, yet its rituals continued unchanged into the second century AD, when it was consulted by Hadrian and visited by Pausanias. 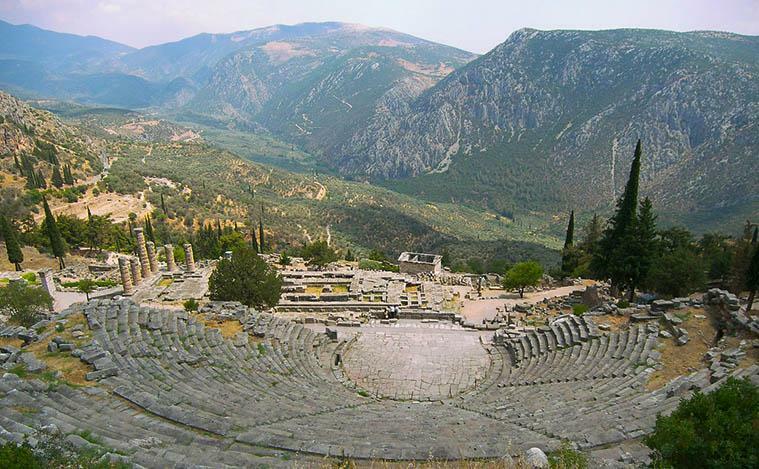 In modern times, the site of Delphi was connected with the attempt to revive the Delphic idea, by the poet Angelos Sikelianos and his wife Eve, who presented two ancient drama, in 1927 and 1930, wanting to create a new spiritual navel land.